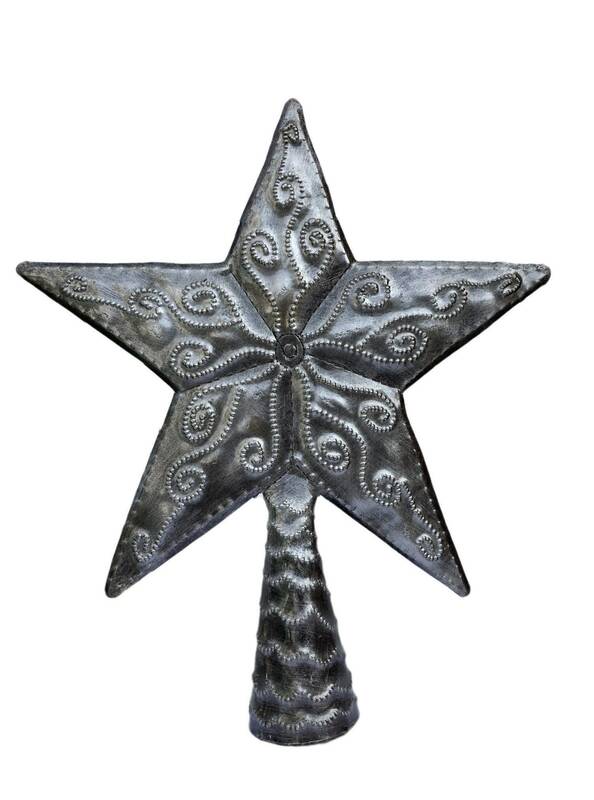 Star, Small Tree Topper, Christmas Art, Festive Home Decor, Hang indoor and outdoor, Decorative Figurine, Handmade in Haiti 8" x 9.25"
The Haitian method of creating sculptures originated over 60 years ago and has changed very little in that time. Outside each workshop are stacked 55 gallon drums, waiting to be prepared. Apprentice artists and laborers cut off the tops and bottoms of the drums, fill them with straw and dry banana leaves, and then light them to burn out residues and strengthen the metal. When cooled, the drums are slit down the sides, pried apart, pounded flat with mallets, and vigorously sanded. At this point the artist takes over, chalking his intended design onto the metal. Using a hammer and chisel and other simple tools, the artist undertakes the intricate work of cutting, beading and detailing each piece. When he is finally satisfied with the results, he pounds his signature onto the sculpture and seals it up with a protective finish. Beautifully made and arriveded very quickly.